I’m not good at following GNOME schedule. I do everything one or two month later :). I just started diving back in the development. I started by providing GEGL vala binding, without exactly knowing whether i will actually need it for GNOME Scan 0.8. Anyway, i activated vala in GNOME Scan build system. How long before automake support vala ? I bumped version to 0.7.0 and will work on GNOME Scan. However, i have tons of things to do aside GNOME Scan : exams, scouting, drive permit, etc. I wish i’ll have the time to develop GNOME Scan before the freezes. Contributions are very welcome. However, GNOME Scan 0.8 needs some rework that can’t be done by a usual contributor. For sure, vala will speed up GNOME Scan development. A good news, the windfarm_pm121 driver i wrote for iMac G5 iSight has been merged in Linus Torvald own tree I’m now one of the thousands contributors to linux kernel ! Thanks Benjamin Herrenschmidt for allowing this to happen. This and GNOME Scan tells me that developing free software is actually what i want to do. This is why i submitted my CV to o-hand for their job offer for junion kernel developer and junior GUI developer. I know i can’t move on London next year, but working with a senior developer on free software is actually what i want to do for my firsts years of work after the university. Gnome Scan hit revision 500 with a brand new feature : automatic per app settings saving in GConf. To get this properly done, i had to hunt ref/unref bug (r499). This mean that gnome-scan is cleaner while having one more feature. Options are stored as /apps/gnome-scan/%app%/%option% . I’m wondering which key would be better. If ever you have an idea, check out the discussion at desktop-devel-list and post your answer. I may write schemas to gconf, but that’s pretty useless. I could also use this feature to store window size and position, and add further behaviour that need to be disablable like a popup notifying user to remove their sheet back from the flatbed scanner, etc. I hope to provide 0.5.92 tomorow along Gnome 2.21.92. I promised you 0.6 for march. It’s going bad for that. 0.5.4 got few feedbacks. I have bug reports by private mail or as comment on the blog which really is noisy rather than useful. Since Fall 2007, i work on websites and Linux PPC hacking. This left Gnome Scan outside the tracks. Handle page-orientation, origin and paper size options in the right order. This lead to much more consistency between preview and result. Fixed a bug in Gegl due to new chanting API migration. Manual area also define page orientation. It’s actually a free selection. Show preview acquisition progress bar, again. Last, but not least : add a common “enhence color” processing step you can simply disable in “Processing” tab. The preview image is clearly enhanced, magically. Thanks to Gegl operation “stress”, available in the workshop. I wish to publish 0.5.6 soon with updated Gegl (including workshop ops). I was away the past week and did not work very much on Gnome Scan. I met with Lionel Dricot and Raphaël Slinkx at Louvain-la-Neuve. Funny I’m just back to home and checking out mails, RSS, and such. The past two weeks were busy on various improvements in Gnome Scan, particularily printing (using GtkPrint). I added the codebase to handle multiple actions (mail to come soon). That’s not that easy since GtkPrint is not flawless for use in such special case : configure scan and print ; acquire and print. It’s more used for a workflow like configure>scan>configure>print. No doubt this Soc has been ful of new features and improvements for Gnome Scan, however, there is place for lot of development. I still didn’t reach the 0.6 stage (i.e. all feature from Gnome Scan 0.4.1 reimplemented). No real processing at all (rotation, deskew, gamma, etc.). I would like to use CPU only where hardware fail this is one reason why i didn’t implemented it yet. I need another project (temporarily named libgnocr) in order to provide a modular OCR API and UI (primarily on top of OCRopus). Contribution are welcome. Preview is not stable nor optimized. Page Orientation is not yet handle (Adding button is not enough for adding a feature :/). Documentation is incomplete (but we have screenshots). Far far far better SANE support. Far far far better scanner handling (no more hardcoded options, etc.). Flegita Gimp : You can use Gegl in Gimp yet ! I’m not satisfied with my amount of work during august. Well, i plan to work fulltime on Gnome Scan next week. Also, is should code a bit this week. Gnome Scan is about 12000 lines of code (excluding headers). The best thing was contact with other people. First with Vincent Untz, my mentor, which was very distant, except when i need him :). Then come all developers from external project like Gegl, OCRopus, AbiWord. The same for #gnome-hackers and various GIMPNet chan members. All that people must receive a hertlich thank from me. The same goes to user for their very important feeback (Merci Jean-François Fortin !) also you, dear reader and commenter. I rewrote flegita-gimp on top of Gnome Scan 0.5.2. It’s in SVN for the 400th revision ! This was very easy to write this plugin, reusing code from the previous one. Once thing to notice, it’s the first ever use of Gegl inside the Gimp ! Keep in mind that Gegl is designed as the future of Gimp. In the future, Gnome Scan and Gimp should speek natively using GeglBuffer, but for Gimp 2.3, i had to translate GeglBuffer into the GimpPixelRgn. Using GeglBuffer allow to manipulate unlimited sized image from high res scan (given there is no memleak). I wonder if that make sense to add advanced option such as layer opacity or layer mode. I already add a field entry allowing to name the field. This avoid to rename the field after scan. Feedback welcome. I provide a screencast video using flegita-gimp 0.5.2 showing the two features provided by the plugin : scan as new image and scan as layer. flegita-gimp should receive improvments like better integration with undo/redo action. launch the Gimp and use /File->Acquisition->Scan or /File->Scan as Layer to trigger the plugin. This is the second plugin on top of Gnome Scan. I’m quite happy with that. Gnome Scan is really cool to use. It really needs debugging and polishing, but the API actually rules. Monday, i will take off for more than two weeks. I will serve about 41 boys for scouting from 10th to 27th. The last few weeks has seen terribily slow progress for Gnome Scan. Even if the TODO list is far from empty, i didn’t have the motivation to get things done. This results on about 3 month of hard working on Gnome Scan. It’s time to get a pause. Scouting is perfect for that. Playing with boys in the nature will make me forget gnome-scan for some times ! During those weeks of fun, i wish that gnome-scan related project such as OCRopus and tesseract or even Gegl will get some improvements. I wish to get back my motivation in late July. August will be a rush for gnome-scan, just for the final evaluation and 0.5.2 release. 0.6 will land for Christmas, just like 0.4. That may be enough to get it included in Gnome 2.22 !? While Gnome Scan 0.4 was quite a “proof of concept”, Gnome Scan 0.5 is a solid base for future development. I intend to begin writing tutorial and – why not ? – a lightning talk for GUADEC 2008. 2.24 or even 2.22 may be an important step for scanning in Gnome. I’m really waiting for a desktop with rocking printing, burning and scanning dialogs in a lot of applications. 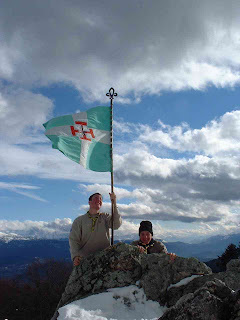 Photo of two friends at Chamechaude in the Alpes moutains in France during winter scout camp. GnomeScan is in the process toward Gnome integration. I submitted the request for a SVN repo and i wish to have it created as soon as Gnome switch entirely to SVN. The most important point today is the creation of the bugzilla products for gnomescan containing libgnomescan, libgnomescanui and flegita components. Enter new bug at http://bugzilla.gnome.org/enter_bug.cgi?product=gnomescan .